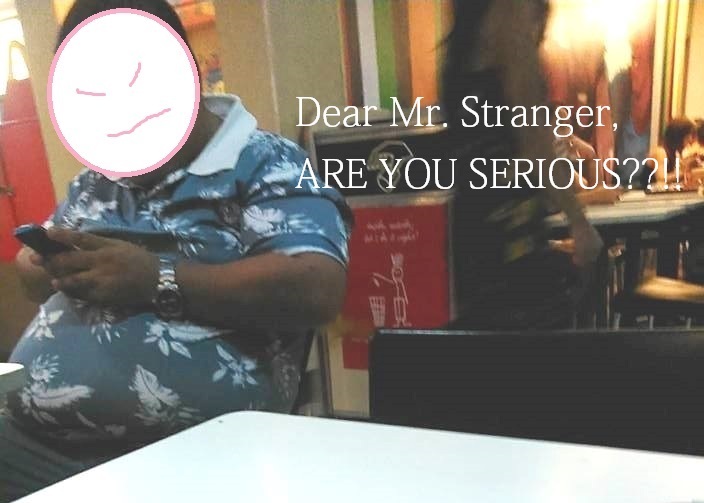 This long post is for you Mr. Stranger sitting next to our table at McDonalds. Please excuse the tone of this as I don’t know how to put it decently. I’m hesitant in posting things like this but it’s obviously bothering me. Also, I might be invading your privacy when I took your photo and write about you, but I don’t think you care about privacy issues, anyway. Sir, I don’t know you but you made me REALLY uncomfortable tonight. I don’t know what your intentions were, maybe they were good but I just don’t see it. I don’t know, but have you not thought that asking VERY personal questions to COMPLETE STRANGERS WHILE THEY’RE EATING isn’t a normal thing to do? Asking VERY personal questions to strangers ISN’T NORMAL, even when they are not eating, okay? It’s not okay. PERIOD. I’m not sure about you sir, but the last time I checked, normal people don’t do that. Asking about a complete stranger’s civil status, kids, job, education, address, and everything else isn’t nice, I tell you. It’s JUST rude and disrespectful. I understand that in many cases, having some casual talk with strangers is okay. I believe that talking to strangers happen, basically because of two reasons: (1) to kill the time and/or (2) to know about someone/something that happens to be of the same interest/situation. I don’t usually have a problem entertaining strangers but this is totally different. First, we are not killing time here. Second, I don’t think we have anything in common, aside from the fact that we are dining at Mcdonalds. YES, WE ARE DINING. I am obviously eating with MY kid and we’re trying to enjoy our meal together, ALONE. Yes, we are in a public place but don’t you think I deserve some privacy with my kid? For God’s sake, my kid and I were sharing our PERSONAL and INTIMATE time together. You never even asked permission nor excused yourself when getting my attention. Right there and then, you just casually approached me by asking if the boy I WAS FEEDING was my younger sibling. UHM thank you but it WASN’T flattering. Really, NO. Honestly, it was kind of insulting. It was insulting how you just throw in that annoying question. It was insulting how you attempted to “flatter” me just so you could “start a conversation”. Sorry sir but I don’t buy it. You terribly failed at your seemingly “no bad intentions” approach. Pardon me, I’ve been asked that question a few times by strangers and I am never offended. I get flattered, but YOU were just different. Your approach was negative. I don’t know why but I just don’t like your aura or vibe or whatever. The moment I heard you asked that first question, I knew it was just a starter line. And oh God, I was never wrong. When I answered that he is MY KID, you then thought it was DEFINITELY OKAY to ask follow-up questions like “where’s his father?” “Are we married?” “Are we from the same school?” “How did my parents react?” “Where was I working” “Are we from this place?” and so on. Wait, wait, wait… WAIT. Excuse me sir, please stop there. Really? Are you serious right now??? I hope you don’t mind me asking sir, but seriously??? WOW. Where did you get that level of confidence asking complete strangers very personal questions? Seriously. Do you really want to know me and everything about my life? Seriously. Why are you asking these questions? Seriously, what do you want to find out? Seriously, have you been stalking me or something? Seriously, do you always do that to random people dining next to you? Seriously. I. DON’T. GET. YOU. !!!! Like really, ARE YOU SERIOUS??? Tonight, I went out with my little boy expecting a fun Saturdate for just the two of us. Tonight, though it was just a quick and spontaneous dine out, it’s our first SOLO “Ice Cream Night” together, as I always take either both kids or just her sister alone when going out at night. Tonight, ALL I WANTED WAS TO ENJOY OUR MEAL TOGETHER, IN PEACE. Tonight was special for me. Special for us. But tonight, YOU just spoiled our night. Tonight, we had to finish our meal quickly and leave the place as soon as we’re done because of your “interrogations”. Tonight, I almost wanted to talk to the management at Mcdonalds but I just kept my cool for my kid’s sake, who was obviously innocent of what was going on. Mister, this isn’t actually the first time I was asked personal questions by strangers. Trust me, I’ve been asked a couple of times, especially about my kids. Though I already expect AND UNDERSTAND that most people are just plainly intrigued and don’t have any bad intentions, I can’t deny that it still annoys me EVERY SINGLE TIME. Somehow, I got used to it that I just manage to smile and ignore the questions. But it gets so irritating how some people just don’t know their limits. Like YOU, sir. You were too pushy. To you, it might not be a big deal. To you, it might just be a simple Q&A out of curiosity. But to me, IT WAS HARASSMENT. You, sir, were already invading our privacy. Didn’t you get it when I said, “Excuse me, mangaon sah mi ha!” Didn’t you get it that I didn’t like answering you? Didn’t you get it that you were completely intruding our private time? I can’t believe how you kept on talking even when I already ignored you. The way I see you, you looked just a few years younger than my father. So obviously, with all the years you’ve lived, you know many many many things more than I do. But I’m just not sure if you know things like “common courtesy, respect, and privacy”. Have you forgotten how to say “Excuse me” when you’re trying to approach someone? Anyone. Have you forgotten how to say “May I” if you wish to ask something? Have you forgotten how to say “Sorry” if you seemed to disturb others? Have you forgotten how to say “Thank you” for other’s time? You, sir, are not a good example of my kid. Just because you are older than me doesn’t give you the right to make me feel inferior and intimidated. Not even in front of my kid. OR maybe you’re asking me too many questions because you’re concerned about my kid as I look like a very young and immature mom, but you know what, I CAN HANDLE US and I KNOW WHEN TO ASK FOR HELP. I don’t think you, asking me questions, have anything to do with being concerned with my kid, or me, or anything. Who needs help eating??? I think you really had some agenda going on. Actually, I was curious why you were sitting there alone when in fact, you weren’t even eating, but you just asked for a service water from the waiter. Hmmm… I wonder what you were really up to. And oh, I almost forgot. In between the times that you were talking to me, some people were calling you on the phone. I’m not sure if you intentional spoke louder so I could hear you that you have BIG CONNECTIONS from the government or if you were naturally loud, BUT the things I overheard involved some dirty game of politics. You mentioned about one BIG CORRUPT POLITICIAN, THE UPCOMING NATIONAL ELECTIONS, and things that seemed like VOTE-BUYING. You seemed to have BIG CONNECTIONS. Really, Mister. ARE YOU SERIOUS??? People like YOU are one of the main reasons why our country is not progressing. People like YOU made me lost a little bit of faith in HUMANITY. People like YOU reminds me again that I SHOULD NOT TALK TO STRANGERS. Seriously, I PITY YOUR FAMILY, sir. Wait, Am I Over Reacting? Over to you guys.. What do you think about people like this? Have you found yourself in a similar annoying situation? I’d love to hear about how you handled them. Please share in the comments below. I totally get your point. I think it was disrespectful and rude to ask too personal questions without even a slight warning and even when he's already ignored. It's either he had a hidden agenda or he had a hidden agenda, I think. I don't like being disturbed by some stranger especially when it's obvious that I wanna be alone. I've experienced taxi drivers asking personal questions to me and it can be scary. There was once when I even lied about my name and where I work just so it wasn't obvious that I was scared. Apart from being annoying, it sounds scary already! I'm thinking he really has an agenda or he would not be sitting alone and preying on people trying to enjoy their meal. Thank you Mimi! 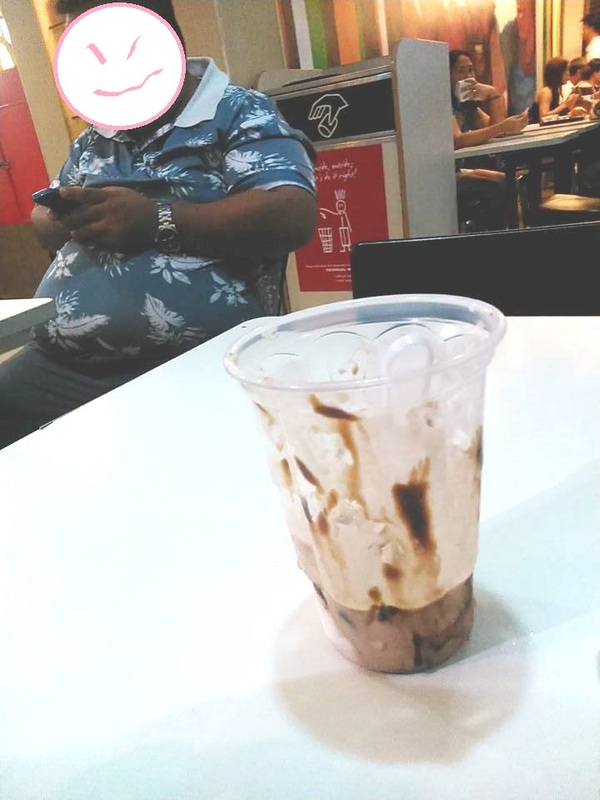 Lagi lami na kaayo ni xa insultuhon ba nga UNSAY LABOT NIMU? AW haha pero chill nalang ko ky kuyog raba si Zion then nagsalig rasad ko since naay security and all. Lesson learned jud. OMG! Don't think I could stay there… and I hope it won't happen to me or maybe not, I never look approachable at times. I would have just smiled and not answer his questions. Or i would have left / moved elsewhere if he was really annoying. Maybe becoz he's also curious if he is really ur son, when I saw ur photo. U look like a teen 😉 ♥♥♥ dats creepy though.. scary!!! He's so big pa naman! Wow, he went from plain annoying to downright scary! I know it's easy to say you should have just left but I know it would alarm your child so I understand why you chose to stay and remain calm – that's not easy to do! Kudos for handling the situation well. Naaahh, that's a situation when lying can actually save us! Hehehe. Naa pud taxi driver na nag ask nako what time ko ga out sa work. Gaaahhh ka scary, syempre I LIED. Hahaha. Perfect response is to stand up and leave. Scary and odd! I had a similar incident a few years ago but I was still single at that time. Really creepy. And that man is creepy too, if he even deserves to be called a "man." I would definitely give him a bad stare if I were at your position too! Baka inaway ko to. haha. Good thing you took a photo of him. It seems like he forgot the word decency. I would, next time talaga. Exactly, right? Haay naku mga tao nga naman. Thank God meron security and all, but would do that next time. Hehe thank you, chill lang pero takot na pala. 🙂 I will leave next time things like this happen. That was exactly all I was thinking so I made sure my valuables were on my side, good thing we were sitting sa corner so wall lang ang katabi. Haay naku! Good move, I will really need to learn to be more direct talaga instead of giving these kinds of people silent treatment. Hmmm creepy! Usually silent kasi ako pag mga ganito. But yeah, lesson learned, will be more active next time this things happen. You've got all the reasons to be annoyed by this man. Mamaya budol gang pa yan e. Happy Sunday! Omg! He could also be a stalker or a thief! He insulted you then asked you personal questions that are NONE OF HIS BUSINESS. I can't believe assholes like these still exist! GAD! Oo nga eh. Very suspicious motive. I had same thoughts at that time. Was too afraid because my son was with me.